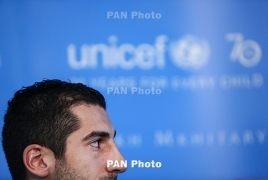 PanARMENIAN.Net - Unai Emery hopes Armenian midfielder Henrikh Mkhitaryan is able to travel to Azerbaijan despite the conflict between the country and the playmaker’s native Armenia over Nagorno Karabakh, Evening Standard reports. Arsenal are due to travel to Baku on October 4 for a Uefa Europa League group stage tie against Azerbaijani champions Qarabag. Whether Mkhitaryan is able to play in that match remains in some doubt due to the ongoing dispute over the Karabakh conflict. Armenians are currently banned from entering Azerbaijan so Mkhitaryan would require an exception to get a visa. In 2015, the then-Borussia Dortmund player opted not to travel for a Europa League game against Gabala, citing security concerns. Emery is hoping for a different solution this time, telling reporters: "I would like that he can [travel] with us. And this problem, if we can together arrange [a solution], it's better. But I have not yet spoken with him." Uefa confirmed that it would support any visa application for Mkhitaryan. "It is a standard procedure for Uefa to send letters of support to associations, clubs or embassies in order to obtain visa for players in order to be able to travel to another country and play in Uefa competition matches,” a spokesperson said. Significantly the Europa League final will also be played in Baku. Should Arsenal make it that far, Mkhitaryan will likely be a key player for Emery.